Chestnut Ridge cabin is small enough for a couple and large enough for a small family. This beautiful cabin is located on fifteen ridge top acres just ten miles from Natural Bridge. Take the spiral staircase up to the private bedroom with a queen bed. There is also a single bed upstairs in the loft. If you need another bed, the IKEA couch pulls out in the living room. The kitchen has a full stove with oven, refrigerator with all kitchen utensils furnished. The cabin has Dish satellite and DVD player. Chestnut Ridge has a covered porch on two sides with wood swing and rockers and a picnic table and chairs. Attached to the covered porch on the back is a deck with a large hot tub. Right off the porch is a charcoal grill, fire ring and picnic table. This cabin is secluded from the other cabins and has a private yard to enjoy. 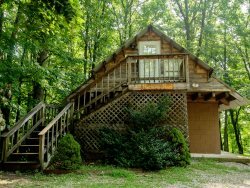 The cabin is part of Chop Chestnut Cabins, which are a located up on a ridge surrounding by woods near to the Red River Gorge. These cabins offer a quiet retreat with views and wooded lots. Each cabin is uniquely designed featuring hot tubs and porches to enjoy the wooded area. A twelve minute drive to the Red River Gorge makes it a great home base for a day hike through the forest or visit to the Natural Bridge area. Then return to grill out in the yard and relax in the hot tubs at these cozy cabins.